Looking for just the right snack at your next “We Love Geometry!” or “Athenian Appreciation Day” party? 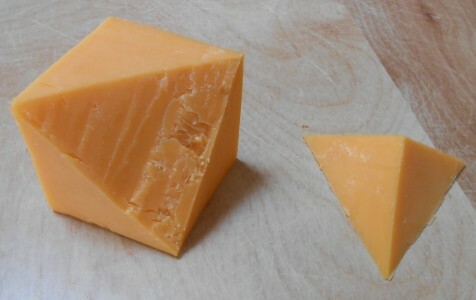 How about a regular tetrahedron of cheese? 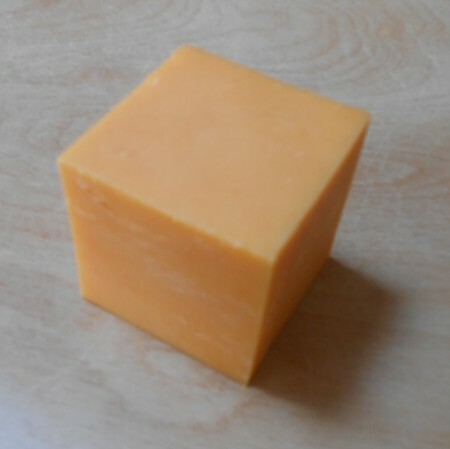 Now, choose any face of the cube, and with the sharp edge of your knife, lightly score the diagonal of the face. 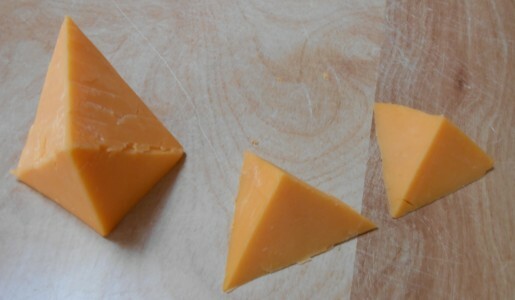 On an adjacent face, lightly score the diagonal that connects at one corner (call it corner A) with the first diagonal you made. 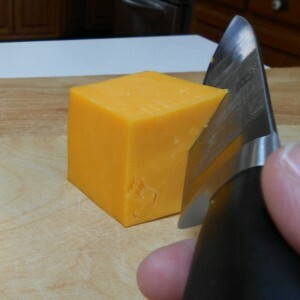 Place the cheese cube on a cutting board with corner A on top pointing toward your cutting hand (i.e., toward the right for me, as I’m a righty). The corner directly below A we will call corner B. 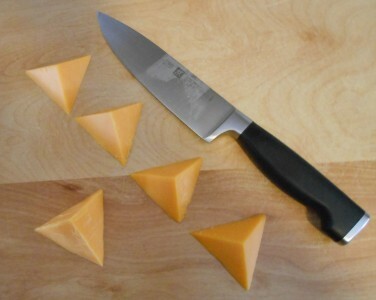 Now slice from corner A diagonally down away from your cutting hand, carefully making sure to keep the two spots where the knife protrudes from the cheese in front and back travelling along the two diagonals you marked. 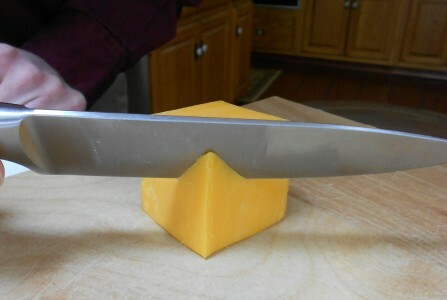 Slice all the way through the cheese on this plane, until your knife simultaneously reaches the two corners diagonally across those faces from A. 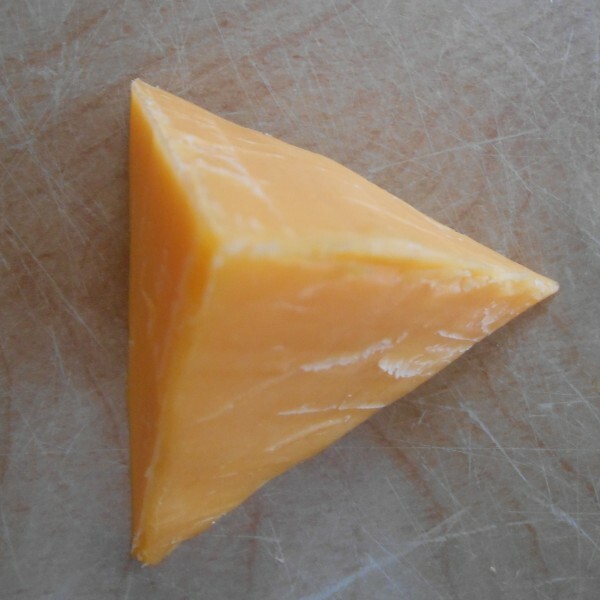 This operation cuts off corner B along with a pyramid of cheese, and leaves an equilateral triangle cross section on the main block of cheese you’re working with. Happy simplex snacking from Math Mondays! Feel free to send pics of other edible geometrical creations to mondays@momath.org as possible fodder for future columns — or just fodder for MoMath staff! This article first appeared on Make: Online, March 18, 2013.